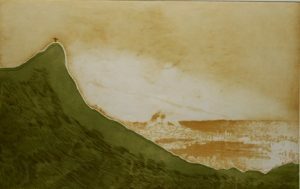 RIO DE JANEIRO, BRAZIL – The Museu Nacional de Belas Artes in Cinelândia is helping to celebrate the 450th anniversary of the city of Rio de Janeiro with it’s final exhibition of this year, “Você está aqui! Rio de Janeiro” (“You are here! Rio de Janeiro”). The exhibition, which began on December 16th and will continue through February 7th, features approximately one hundred pieces including paintings, engravings, sketches, drawings, photographs, objects, furniture, and sculptures. A work on display as part of the ongoing ” Você está aqui! Rio de Janeiro” (“You are here! Rio de Janeiro”) exhibition in Museu Nacional de Belas Artes, press image. The Museu Nacional de Belas Artes (MNBA) has been celebrating the city’s anniversary throughout the year with exhibitions and events. With the “You are here! Rio de Janeiro” exhibition, the museum is presenting lesser known and in some cases never before exhibited pieces from its own collection to showcase parts of the city’s history. The exhibition is displayed in three halls of the MNBA and is divided into nine sections, with each section representing a different aspect of the city. The sections are “Tempo” (Time), “São Sebastião”, “Panoramas” and “Cidade desconstruída” (Deconstructed City). Also; “Bairros” (Neighborhoods), “Coisas de carioca” (Rio Residents’ Things), “Cinelândia e as artes” (Cinelândia and the arts), “Poltrona mole e literatura” (Soft Armchair and literature), “Orelhão” (Phonebooth), “Corcovado” (Corcovado), “Cidade abstraída” (Abstracted City), e “Política” (Politics). Those nine sections feature works by Rodolfo Bernardelli, Pedro Vasquez, Glauco Rodrigues, Daniel Senise, Vitor Meireles, Ana Bela Geiger, Athos Bulcão, Le Corbusier, Anna Letycia, Rubem Grilo, Oswaldo Goeldi, Thereza Miranda, Ziraldo, Calixto, Farnese de Andrade, Carlos Scliar, Djanira, Darel, Fayga Ostrower, Rubens Gerchman, Gustavo Dall’Ara, Portinari, Adir Botelho, Monica Barki, and Ciro Fernandes. Entry to the Museu de Belas Artes is free on Sundays. When: December 16th through February 7th. Open Tuesdays to Fridays 10AM to 6PM and Saturdays, Sundays and holidays 12AM to 7PM. Entrance: R$4 – R$8. Free on Sundays.